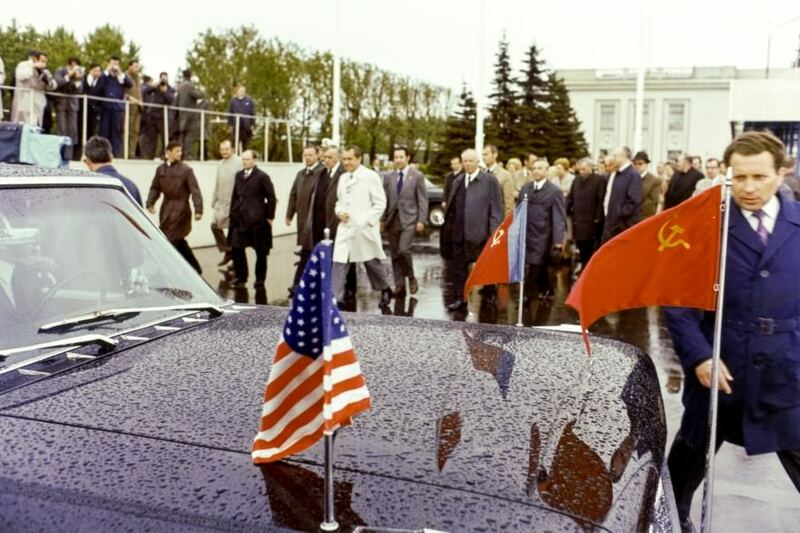 It was Nixon’s second visit to the Soviet Union–his first was as Vice President, in 1959. 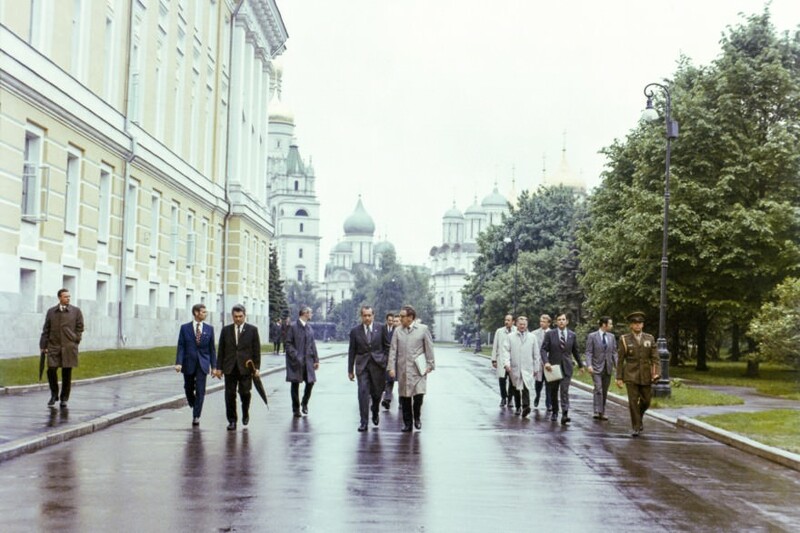 The trip was to meet with Leonid Brezhnev, General Secretary of the Central Committee of the Communist Party of the Soviet Union. 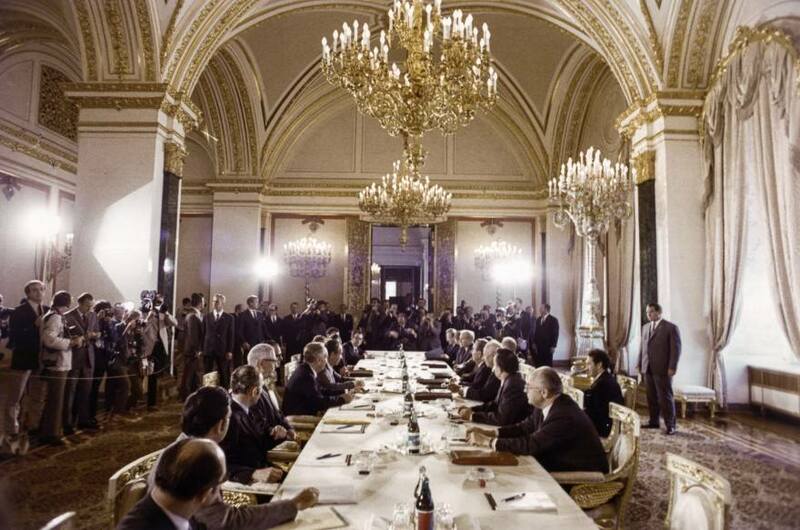 The Moscow Summit of 1972, as the meetings between the two were known, was held from May 22 and May 30, 1972. Coming on the heels of his much celebrated visited to China, the Moscow Summit was a signature success for Nixon. It was a seminal event in the development of East-West Cold War detente. The key agreement to come out of the summit related to curbing the growth of nuclear arsenals with the signing of the Anti-Ballistic Missile (ABM) Treaty, which was also the first Strategic Arms Limitation Treaty (SALT I). 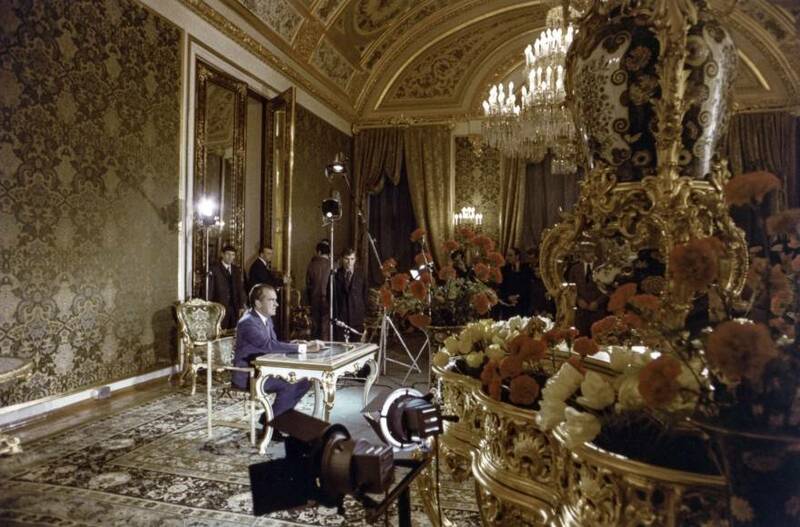 On his way home, Nixon dropped by Iran and Poland (he’d stopped in Austria enroute to Moscow). With a dramatic flourish, as soon as he arrived back home, he rode in Marine One straight to Capitol Hill. 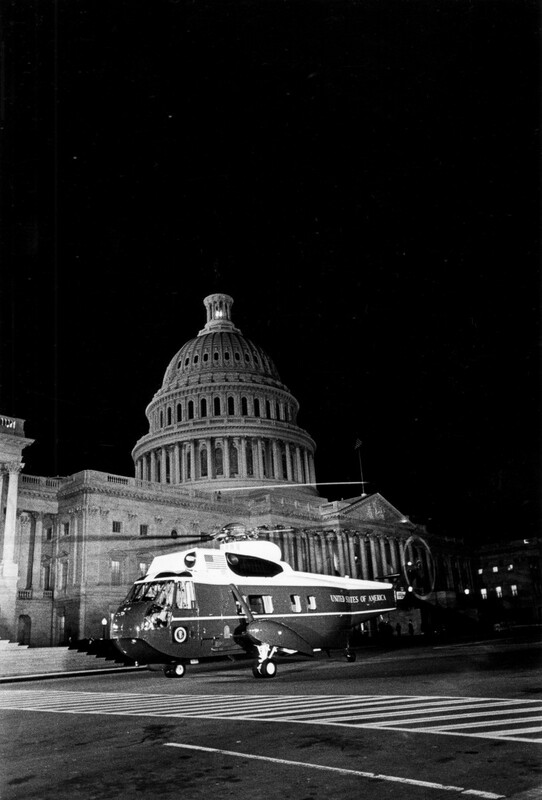 The presidential helicopter landed on the eastern plaza of the Capitol Building, and Nixon went straight inside to address a joint sitting of Congress. 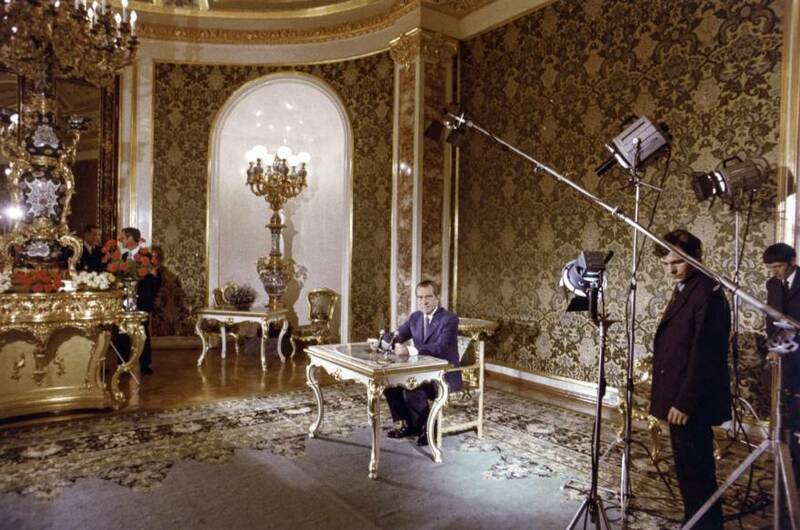 President Nixon addresses the people of the USSR and United States on a live television broadcast from the Green Room in the Grand Kremlin Palace on May 28, 1972, between 8:30 PM and 8:54 PM. The simultaneous broadcast in the United States was facilitated by satellite. Photo by Oliver Atkins, White House Photo Office (WHPO). Courtesy of Nixon Library. 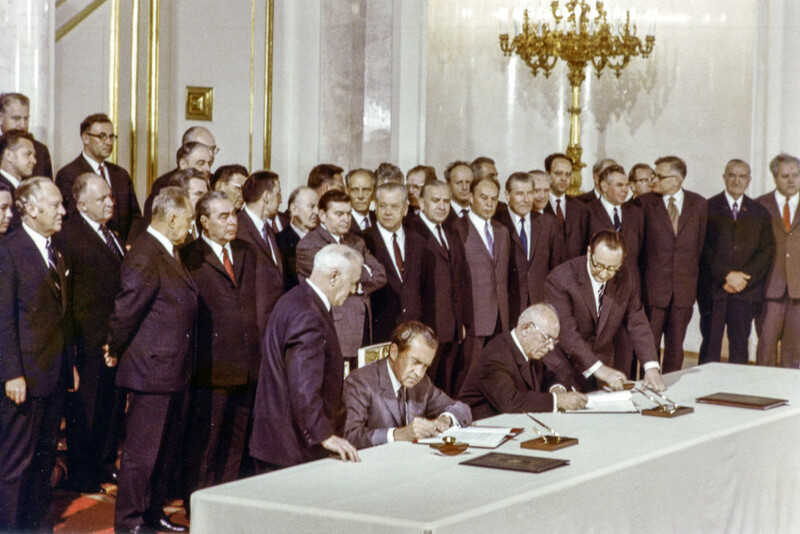 President Nixon and Nikolay Podgorny (Chairman of the Presidium of the Supreme Soviet of the USSR) sign agreements in cooperation between the United States and USSR in the fields of environmental protection, medical science, and public health. 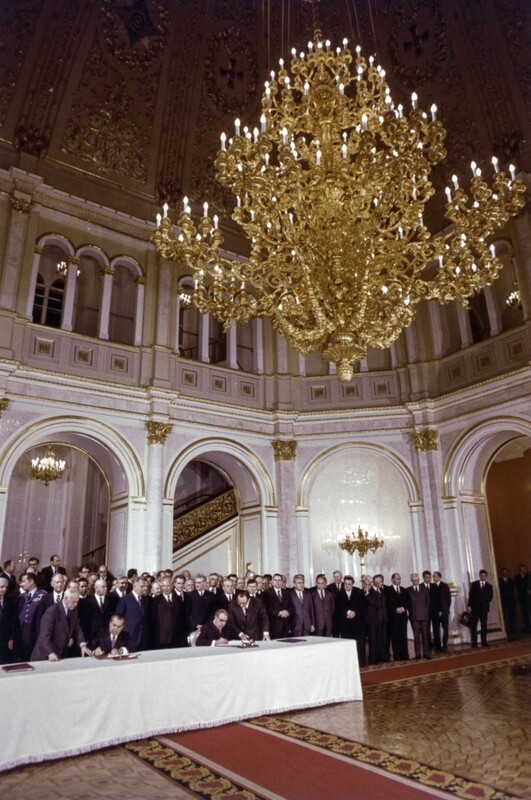 The signing ceremony took place in St. Vladimir Hall in the Grand Kremlin Palace, Moscow, between 6:08 PM and 6:20 PM on May 23, 1972. Photo by Oliver Atkins. White House Photo Office (WHPO). Courtesy of Nixon Library. President Nixon and Nikolay Podgorny approach the president’s limousine on May 27, 1972. Photo by Oliver Atkins. White House Photo Office (WHPO), Nixon Library. 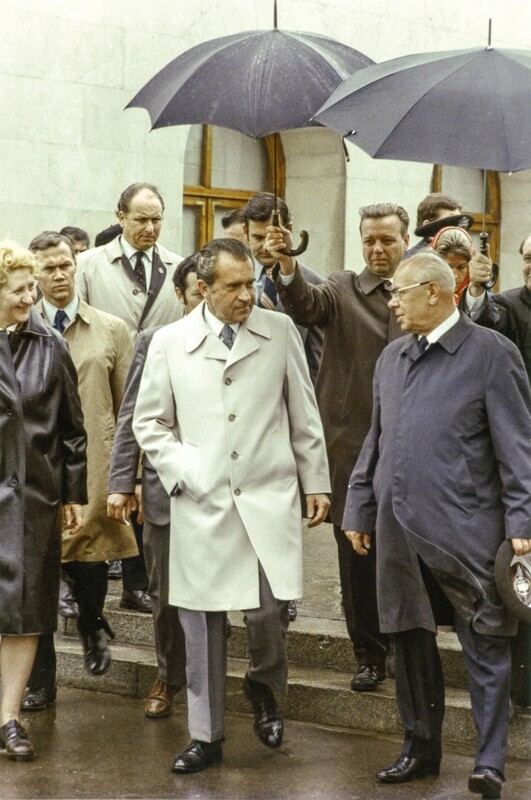 President Nixon and Nikolay Podgorny talk oustide May 27, 1972. Photo by Oliver Atkins, White House Photo Office (WHPO). Courtesy of Nixon Library. 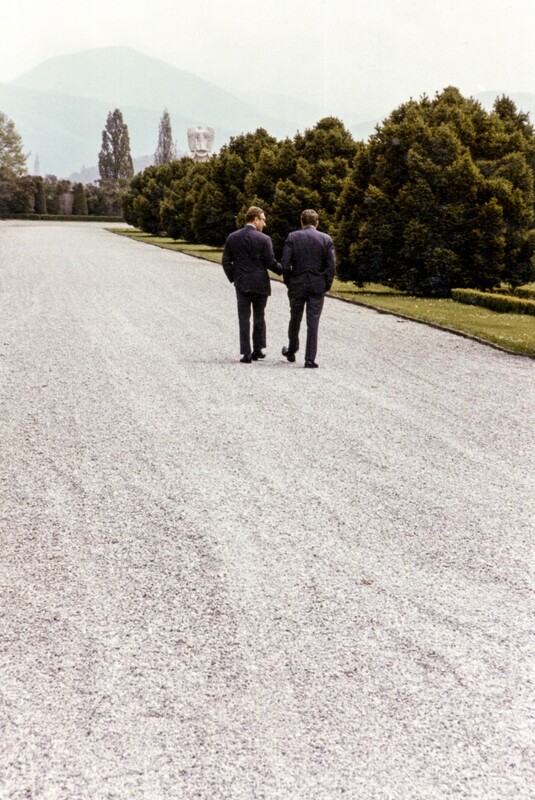 President Nixon and Henry Kissinger talk while walking around the grounds of Schloss Klessheim in Salzburg, Austria, on May 21, 1972, between 11:35 AM and 12:03 PM. Photo by Robert L. Knudsen, White House Photo Office (WHPO). Courtesy of Nixon Library. 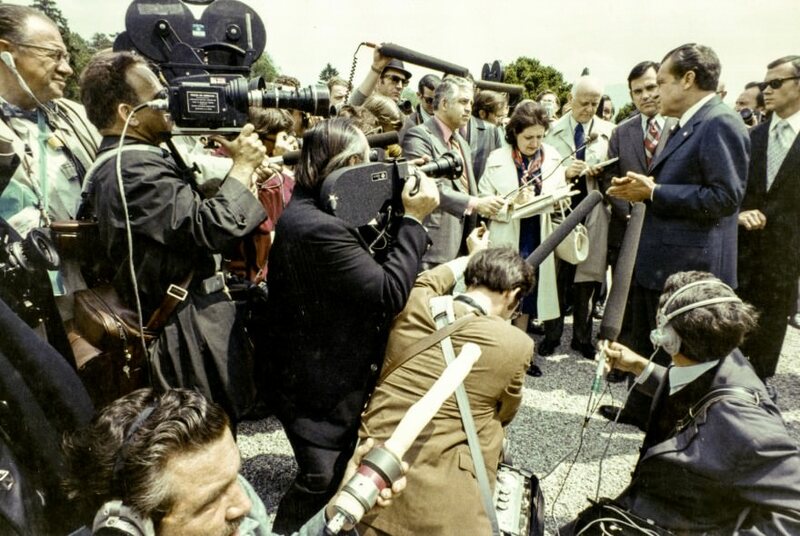 President Nixon, accompanied by White House Press Secretary Ron Ziegler, holds an informal press conference at the front gate of Schloss Klessheim in Salzburg, Austria, on May 21, 1972, between 11:35 AM and 12:03 PM. Photo by Oliver Atkins, White House Photo Office (WHPO). Courtesy of Nixon Library. 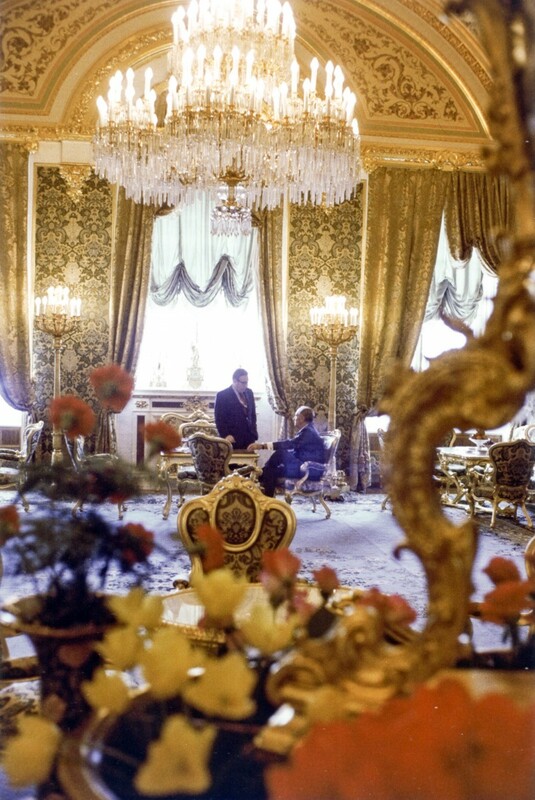 Henry Kissinger and an unidentified person meet in one of the ornately decorated rooms of the Kremlin on May 24, 1972. Photo by Oliver Atkins. White House Photo Office (WHPO), Nixon Library. 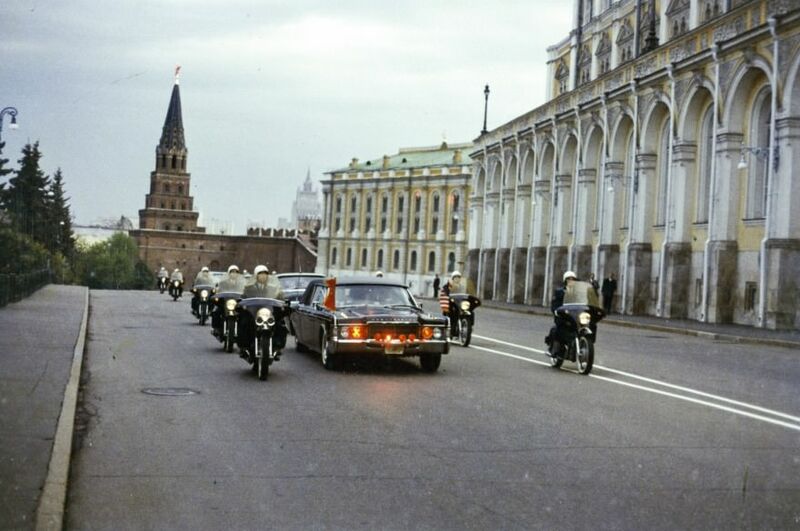 President Nixon’s motorcade inside the Kremlin grounds in Moscow, USSR, on May 22, 1972. Photo by Oliver Atkins, White House Photo Office (WHPO). Courtesy of Nixon Library. 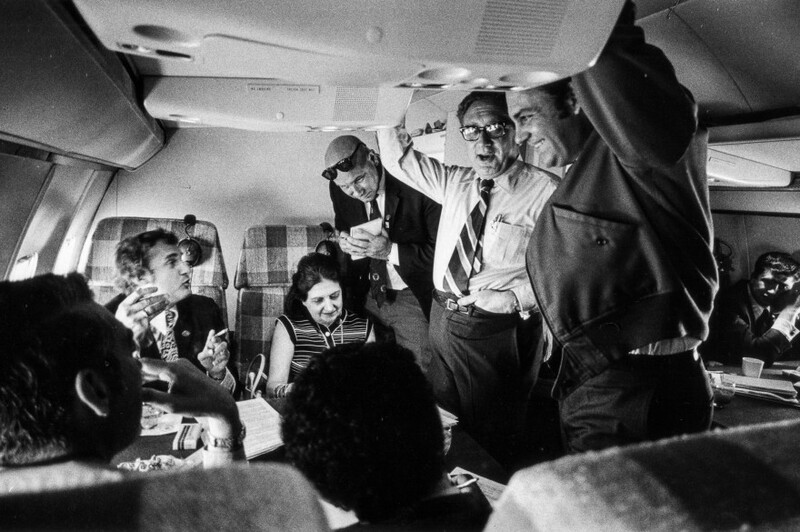 Henry Kissinger talks with members of the press aboard the “Spirit of ’76” on May 31, 1972. Seated closest to Kissinger, facing the camera, is AP correspondent Helen Thomas. Photo by Oliver Atkins. 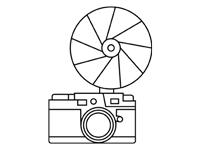 White House Photo Office (WHPO). Courtesy of Nixon Library. 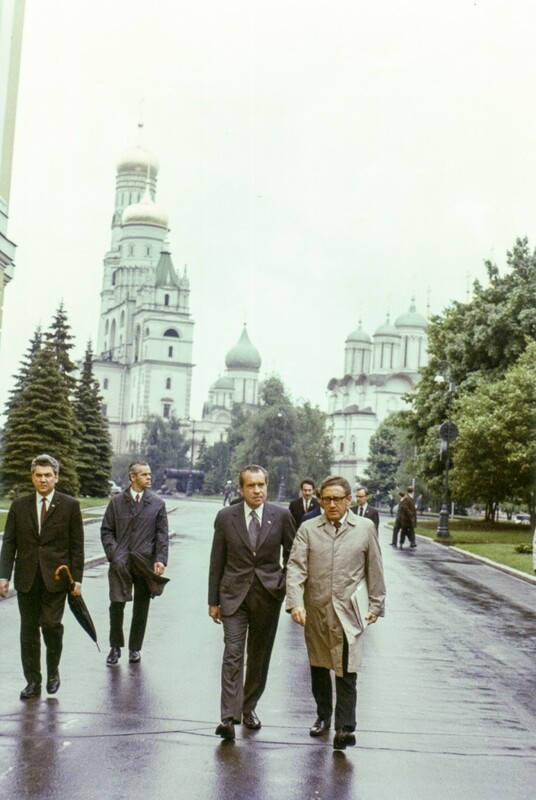 President Nixon, accompanied by Henry Kissinger, walk between meetings in the Kremlin, Moscow, on May 22, 1972. Photo by Oliver Atkins. White House Photo Office (WHPO), Nixon Library. 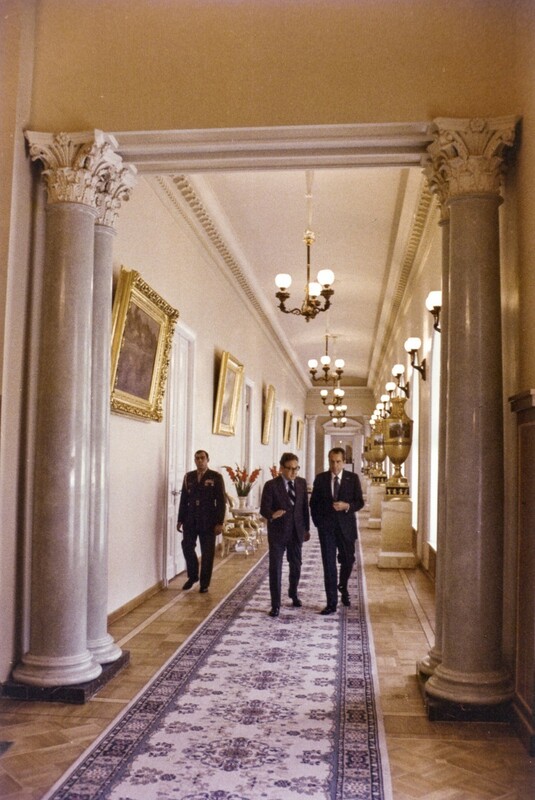 President Nixon walks with Henry Kissinger from the president’s suite in the Kremlin Palace annex to St. Catherine’s Hall in the Grand Kremlin Palace on May 23, 1972, between 11:32 AM and 11:34AM. Photo by Oliver Atkins. White House Photo Office (WHPO). Courtesy of Nixon Library. President Nixon meets Leonid I. Brezhnev (Secretary-General of the Central Committee of the Communist Party of the USSR) in the Council of Ministers building in the Kremlin, Moscow, on May 22, 1972, at 6:18 PM. Photo by Robert Knudsen, White House Photo Office (WHPO). Courtesy of Nixon Library. 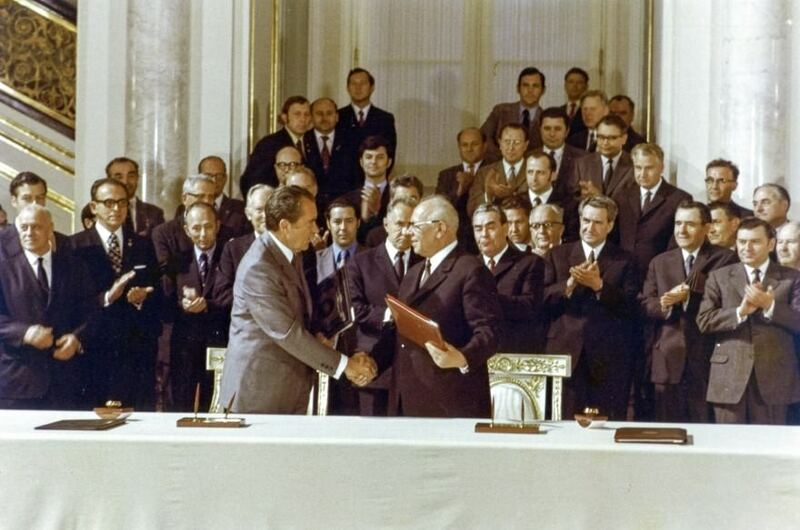 President Nixon and Nikolay Podgorny (Chairman of the Presidium of the Supreme Soviet of the USSR) sign agreements in cooperation between the United States and USSR in teh fields of environmental protection, medical science, and public health. 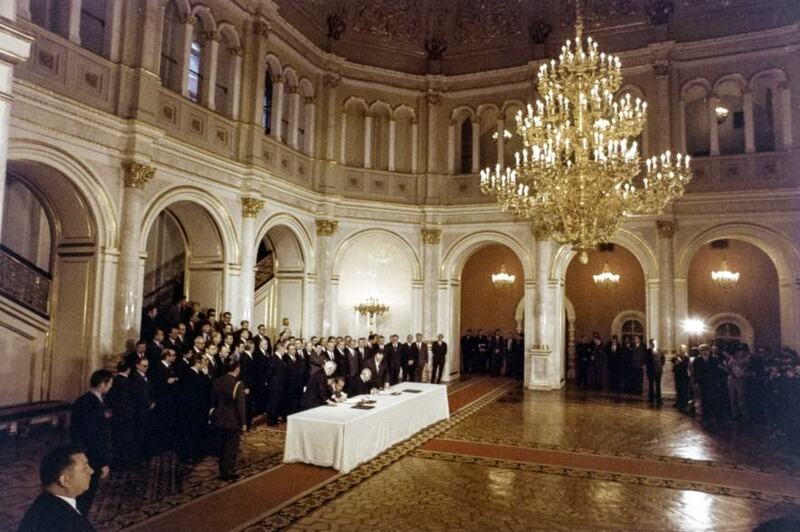 The signing ceremony took place in St. Vladimir Hall in the Grand Kremlin Palace, Moscow, between 6:08 PM and 6:20 PM on May 23, 1972. Photo by Oliver Atkins. White House Photo Office (WHPO). Courtesy of Nixon Library. 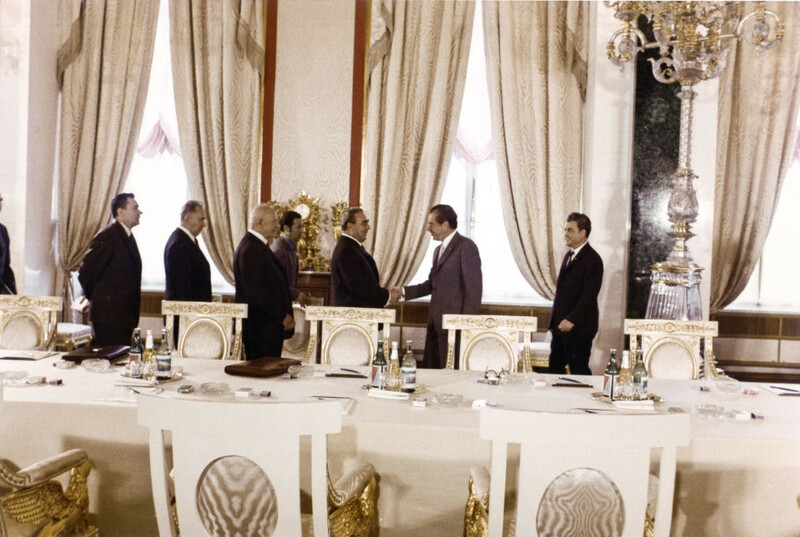 President Nixon, accompanied by aides (sitting on left side of table), met with Leonid Brezhnev and his advisers in the Council of Ministers building in the Kremlin on May 23, 1972, between 7:20 PM and 10:00 PM. 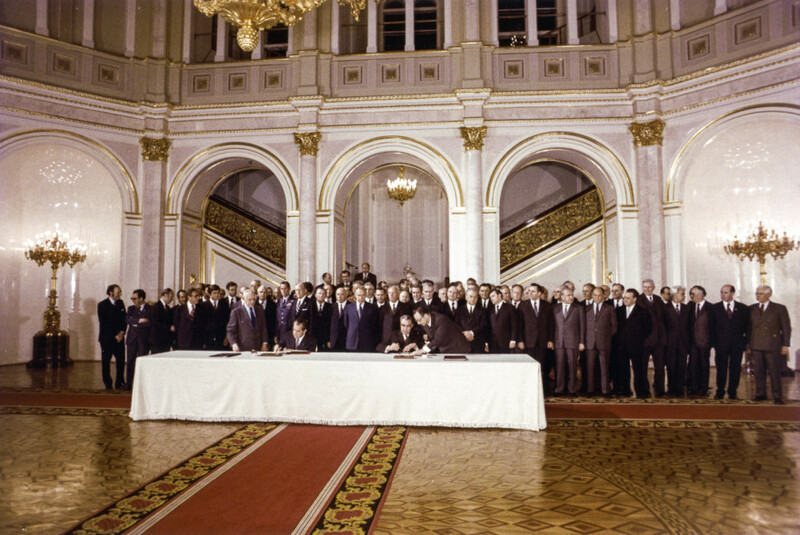 The Soviet delegation is sitting on the right-hand side of the table. Brezhnev is in the middle. To his left are Nikolay Podgorny, Andrei Gromyko, and Anatoly Dobrynin. Photo by Oliver Atkins, White House Photo Office (WHPO). Courtesy of Nixon Library. 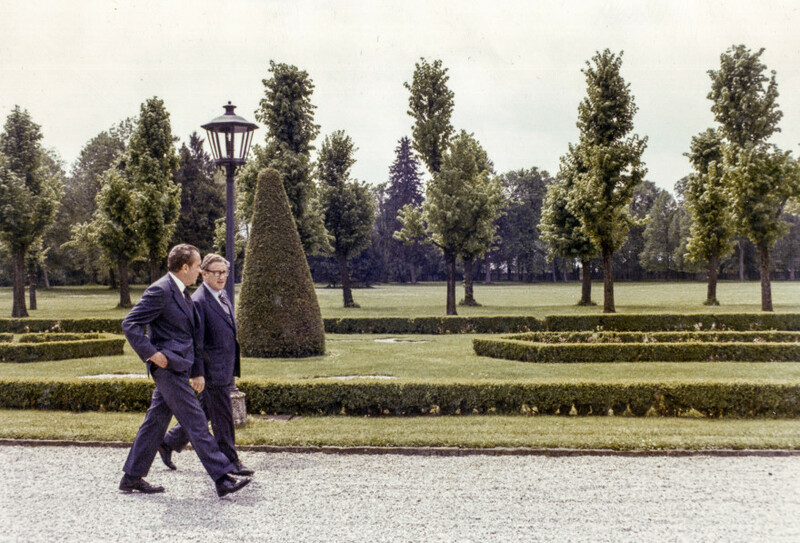 President Nixon and Henry Kissinger talk while walking around the grounds of Schloss Klessheim in Salzburg, Austria, on May 21, 1972, between 11:35 AM and 12:03 PM. Photo by Oliver Atkins, White House Photo Office (WHPO). Courtesy of Nixon Library. 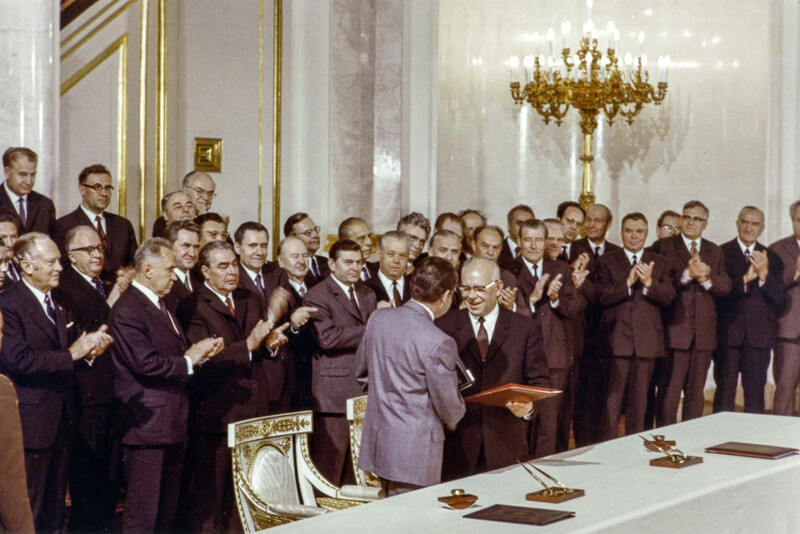 President Nixon and Nikolay Podgorny (Chairman of the Presidium of the Supreme Soviet of the USSR) sign agreements in cooperation between the United States and USSR in the fields of environmental protection, medical science, and public health. 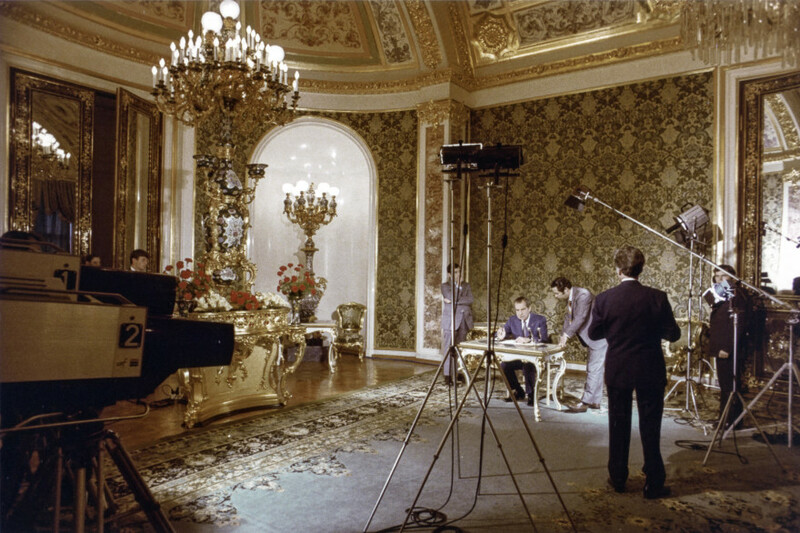 The signing ceremony took place in St. Vladimir Hall in the Grand Kremlin Palace, Moscow, between 6:08 PM and 6:20 PM on May 23, 1972. Photo by Robert Knudsen, White House Photo Office (WHPO). Courtesy of Nixon Library. 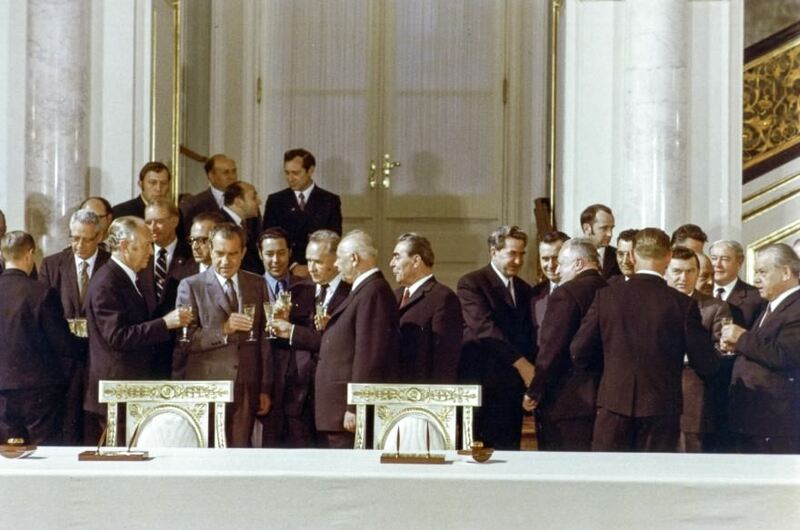 President Nixon and Secretary of State William Rogers toast the signing of agreemens in cooperation between the United States and USSR in the fields of environmental protection, medical science, and public health in St. Vladimir Hall in the Grand Kremlin Palace, Moscow, between 6:08 PM and 6:20 PM on May 23, 1972. They are joined by Nikolay Podgorny (Chairman of the Presidium of the Supreme Soviet of the USSR), Leonid Brezhnev, and Alexei Kosygin. Photo by Robert Knudsen, White House Photo Office (WHPO). Courtesy of Nixon Library. President Nixon speaks with Leonard Brezhnev at the signing ceremony in St. Vladimir Hall in the Grand Kremlin Palace on May 24, 1972, between 6:10 PM and 6:28 PM. Photo by Oliver Atkins. White House Photo Office (WHPO). Courtesy of Nixon Library. 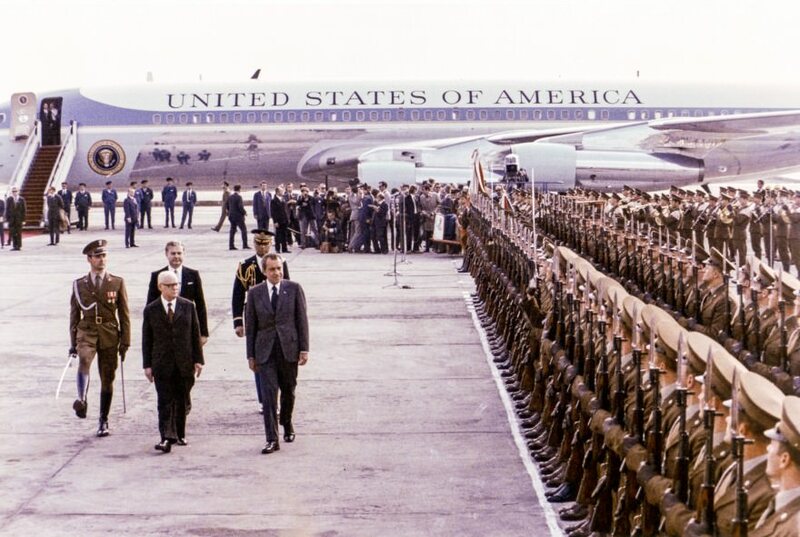 President Nixon reviews a Polish honor guard with Henryk Jablonski at Warsaw’s Okecie International Airport on May 31, 1972, between 5:01 PM and 5:25 PM. Photo by Robert Knudsen, White House Photo Office (WHPO). Courtesy of Nixon Library. 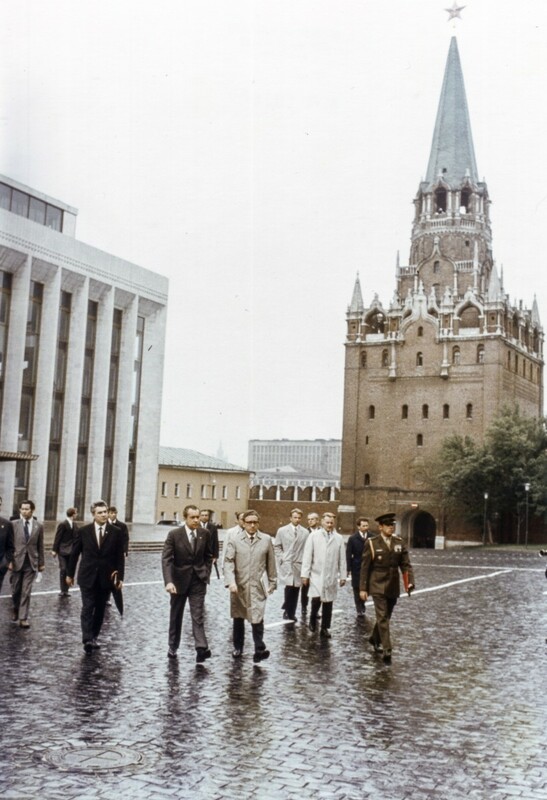 President Nixon, accompanied by Henry Kissinger, walk between buildings in the Kremlin, Moscow, on May 29, 1972. Photo by Oliver Atkins. White House Photo Office (WHPO). Courtesy of Nixon Library. 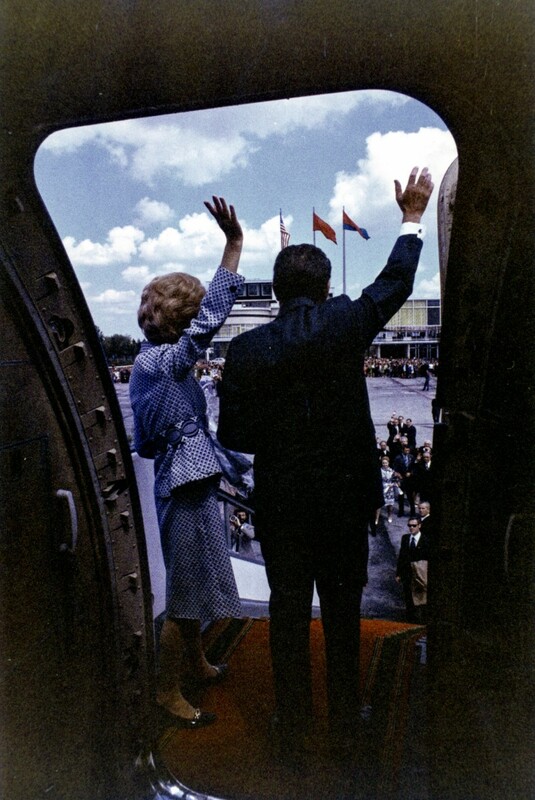 President Nixon and First Lady Pat Nixon wave to the crowd before departing on Air Force One on May 29, 1972. Photo by Oliver Atkins. White House Photo Office (WHPO). Courtesy of Nixon Library. 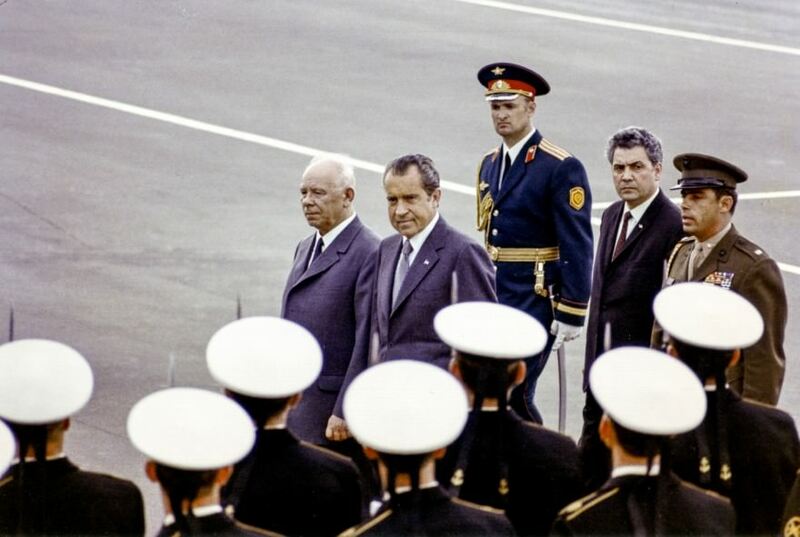 President Nixon reviews a Soviet honor guard during an arrival ceremony at Moscow’s Vnukovo II Airport. 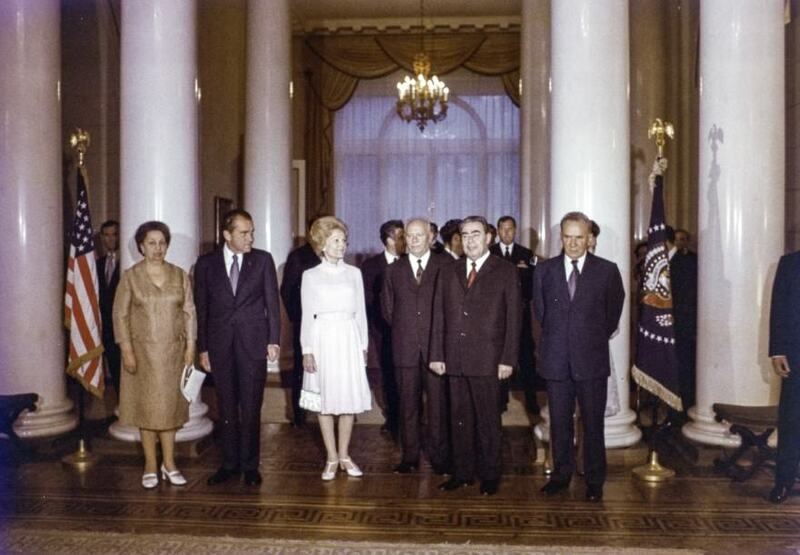 Beside Nixon is Nikolay V. Podgorny (Chairman of the Presidium of the Supreme Soviet of the USSR). The arrival ceremony was broadcast live on world wide television networks. Photo by Jack Knightlinger, White House Photo Office (WHPO). 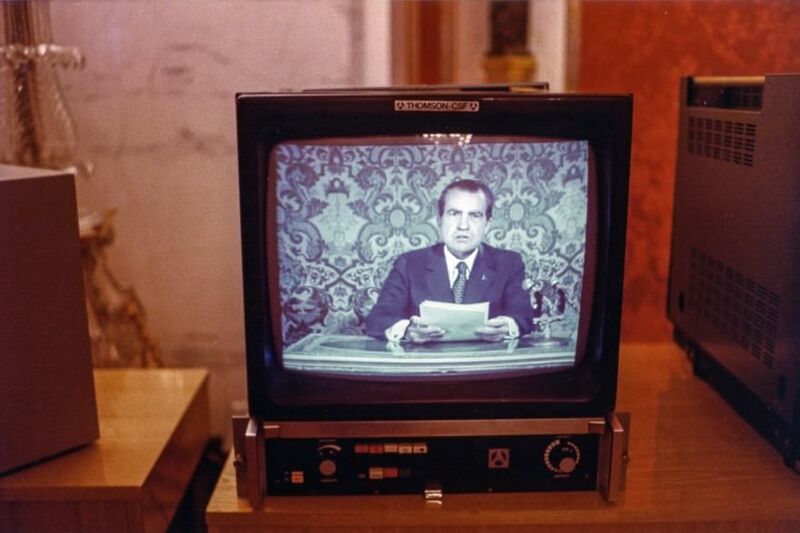 Courtesy Nixon Library. 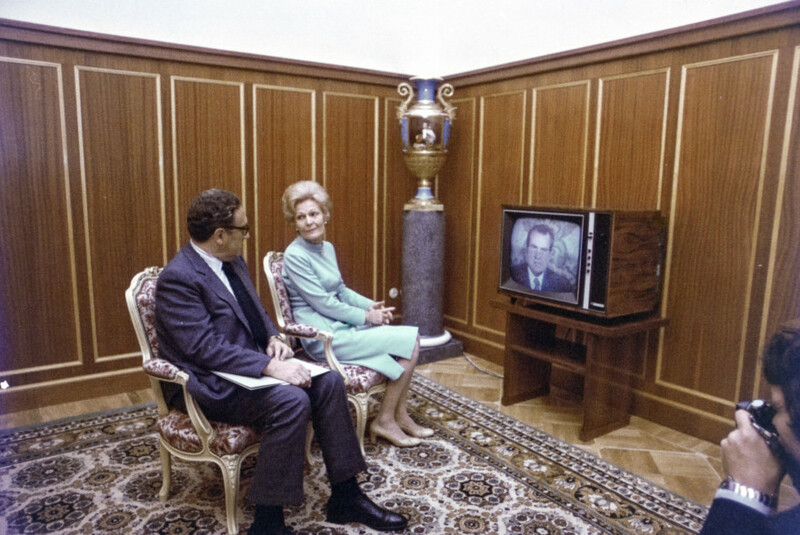 First Lady Pat Nixon and Henry Kissinger watch as President Nixon addresses the people of the USSR and United States on a live television broadcast from the Green Room in the Grand Kremlin Palace on May 28, 1972, between 8:30 PM and 8:54 PM. The simultaneous broadcast in the United States was facilitated by satellite. Photo by Jack Knightlinger. White House Photo Office (WHPO), Nixon Library. 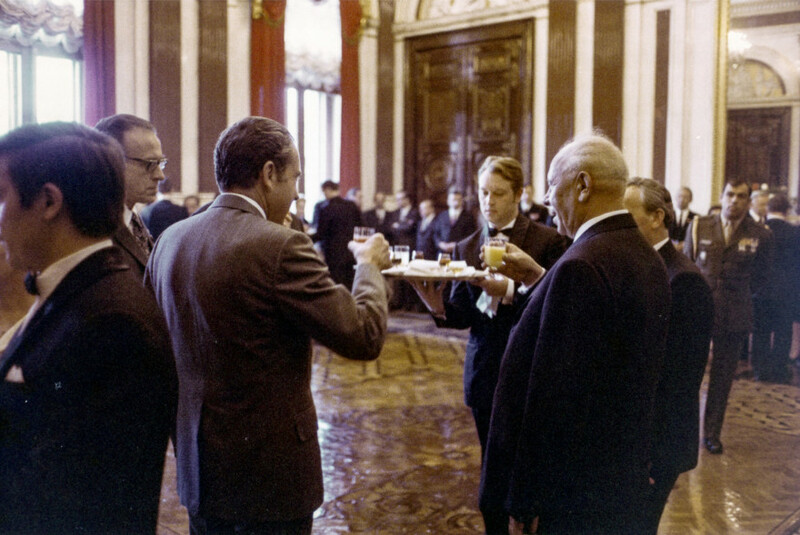 President Nixon and Nikolay Podgorny raise a toast on May 27, 1972. This was probably taken at a reception before a luncheon hosted by the Executive Committee of the Leningrad Council of Workers Deputies at Leningrad City Hall, Mariinsky Palace. Photo by Oliver Atkins, White House Photo Office (WHPO). Courtesy of Nixon Library. President Nixon and Leonid Brezhnev sign the SALT agreement in St. Vladimir Hall in the Grand Kremlin Palace on May 26, 1972, at 11:07 PM. Photo by Robert Knudsen, White House Photo Office (WHPO). Courtesy of Nixon Library. President Nixon and First Lady Pat Nxion pose for a photo with Nikolay Podgorny (Chairman of the Presidium of the Supreme Soviet of the USSR), Leonid Brezhnev (Secretary General of the Central Committee of the Communist Party of teh USSR), Mrs. Leonid Brezhnev, and Aleksey Kosygin (Chairman of the Council of Ministers of the USSR) before a dinner hosted by President Nixon and the First Lady on May 26, 1972, at 7:20 PM. The SALT agreement was signed after the dinner. Photo by Robert Knudsen, White House Photo Office (WHPO). Courtesy of Nixon Library. President Nixon and Leonid Brezhnev sign the SALT agreement in St. Vladimir Hall in the Grand Kremlin Palace on May 26, 1972, at 11:07 PM. Photo by Byron Schumaker, White House Photo Office (WHPO). Courtesy of Nixon Library. When they returned to the United States, Air Force One landed at Andrews Air Force Base. There, the President and First Lady boarded Marine One and flew to the southeast side of the Capitol. They were greeted by their daughters. 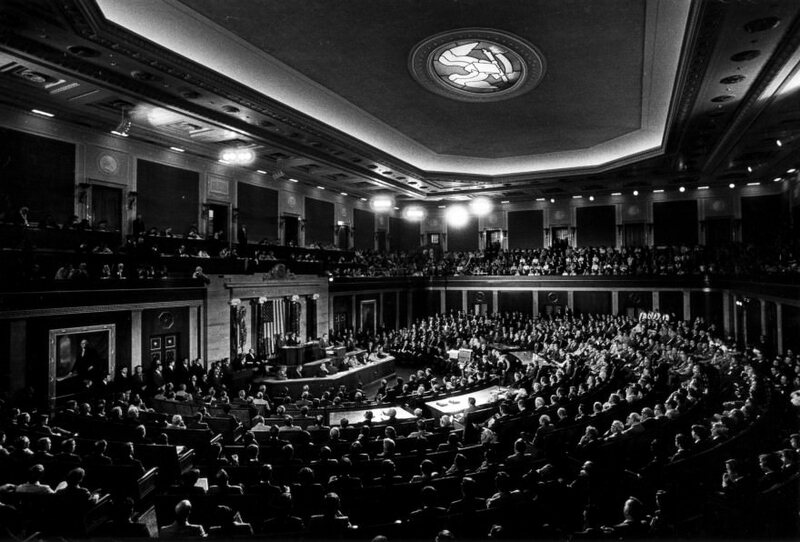 Then, escorted by William M. “Fishbait” Miller (Doorkeeper of the House of Representatives), President Nixon went to the speaker’s platform in the House chamber to address a joint session of Congress on the results of his trip to the Soviet Union. The address was broadcast live on radio and television. 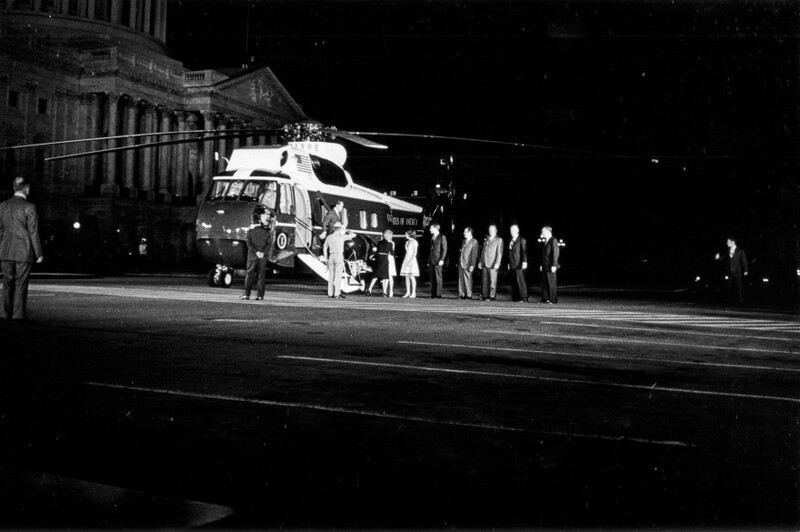 President Nixon, having flown in the presidential helicopter from Andrews Air Force Base to the southeast side of the Capitol upon returning from his trip to the USSR, addressed a special joint session of Congress on June 1, 1972, between 9:42 PM and 10:03 PM. Photo by Andrew Grove, White House Photo Office (WHPO). Courtesy of Nixon Library. 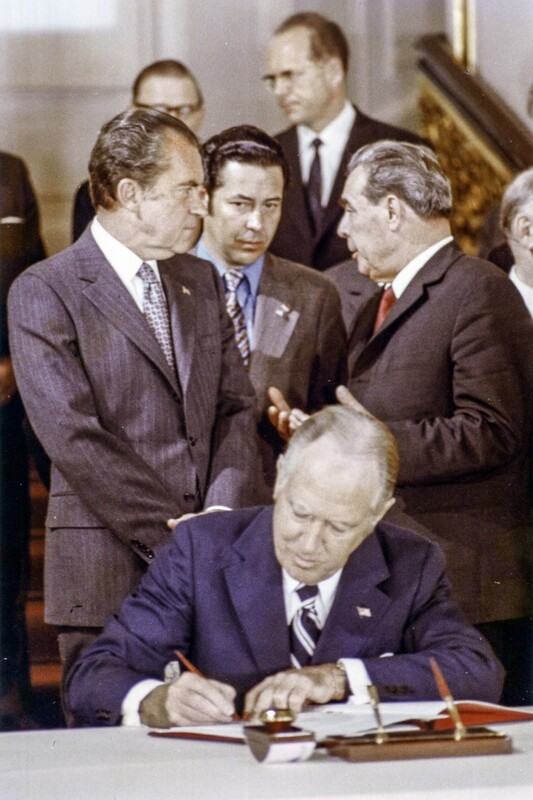 President Nixon, having flown in the presidential helicopter from Andrews Air Force Base to the southeast side of the Capitol upon returning from his trip to the USSR, addressed a special joint session of Congress on June 1, 1972, between 9:42 PM and 10:03 PM. Photo by Karl Schumacher. White House Photo Office (WHPO), Nixon Library.